Each studio features the unique archway characteristic of the old canaves, and each has its own magical view of the Caldera. The studios are individually decorated in traditional style, yet with each unit having its own district character. The beds are built into the foundations and the furnishing and decorations add to the character of the architectural design. The accommodation are divided by size into standard, standard with sitting area, superior, and apartment for two, and all units have private balcony with view to the volcano. air conditioning, mini fridge, satellite TV, safe box, direct-dial phone, mini hi-fi, hairdryer, and private bathroom. The hotel's facilities include swimming pool, with sun terrace and lounges, a pool bar, daily maid service, and Internet facilities. The Standard Studio of Hotel Afroessa is built according to the traditional architecture and blends with the landscape of Santorini. The bedroom with the built-in bed is separated from the sitting area creating the perfect place for relaxation. The sitting area has a built-in sofabed and a dining table for your every-day meals. 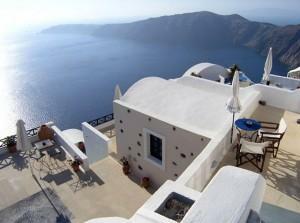 There is a terrace with magnificent view to the Caldera. The 2 Deluxe Studios of Hotel Afroessa take guests back to past times, where romance had a leading role. The cast-iron bed of the one studio and the built-in bed of the other, in combination with the wooden traditional furniture, create a warm and hospitable surrounding, while the terrace with the open view to the Caldera is stunning. The Apartment for Two of Hotel Afroessa is equipped with traditional wooden furniture which, in combination with the warm lighting and the bright colorings, creates a unique surrounding. Here you will feel at home, since everything has been chosen very carefully. The Apartment has a terrace with magnificent view to the Caldera.